Australia’s first large-scale trial of telehealth has shown that it could save up to $3 billion a year to the nation’s healthcare system. Jack: Without the machine, we wouldn’t have known there was anything seriously wrong. All your blood pressure, all your heart problems, or any other problems, we find out about it. Bill: Before she was going to the doctors two or three times a week, now, she only goes once every three weeks. Gary: It’s so reassuring to know somebody’s double checking and checking all your vitals, and ready to ring you up if they feel that, you know, there’s something wrong. Jack: In April this year, I had a triple by-pass. Without the monitor we wouldn’t have known that there was anything seriously wrong. It found out things about my heart that I wouldn’t have known about until it were too late and I’d probably be gone by now. Prof Branko Cellar: The population is ageing, those aged over 65 will double and those aged over 85 will quadruple in the next 20-years. Chronic disease, at present, consumes over 70 per cent of the total healthcare budget and is growing so rapidly that it could consume all of the state budgets within 20-years. Telehealth is one of the best ways of trying to reduce hospitalisation, and therefore, hospital costs. Dr Rajiv Jayasena: We have shown that we can demonstrate reduction in primary healthcare costs, such as, GP visits, specialist visits, laboratory tests. Patients who are really suited for monitoring at home are patients with multiple chronic diseases, so that they can learn how to self-manage and take control of their disease. Prof Branko Cellar: So the patients are a key player in the total management of their chronic condition. Bill: I jumped on it straightaway when Lay came to me and said, “Would we like to do it?” And there was no hesitation and with the help of this monitor, I don’t get so scared anymore. and it takes a lot of pressure off your GP. This way you don’t need to go down there if it’s only something minor. Gary: For a person who doesn’t know about computers it is incredibly easy to use. At times, you know, the readings have looked erratic to me, and I’ll say to the Wife, that I expect a call from Lay tonight. Lay Yean Woo: The clients will look at it taking their vital observations, then I’ll monitor, through my computer, and then checking out their vital signs for any abnormalities, and from there I will be contacting the clients and suggesting or discussing with them how their heath condition is and follow up with a care plan. This technology as helped me as a Nurse and this has made my time more efficient in the way I deliver my service. Also, with the time that has been freed up, I can look at more new clients being referred to me. At the end of the day I know they are better looked after. Gary: It’s so reassuring to know somebody’s double checking all your vitals. Dr Rajiv Jayasena: We’ve seen an increased quality of life in patients who are being monitored in our trial. We’ve also seen when they went to hospital they ended up coming home earlier, about seven to nine days. And also we’ve demonstrated in the trial that anxiety and depression has decreased in these patients. Jack: Oh the machine is very important, because it gives us piece of mind. Bill: I can’t thank her enough for what she’s done for Janice and what the machine has done. Gary: It’s kept me going. Yeah, I’d be lost without it really. The research, undertaken by CSIRO together with partners, involved trialling telehealth systems with 287 patients over a 12 month period. It showed savings of 24 per cent over the year to the healthcare system made through falls in the number and cost of GP visits, specialist visits and procedures carried out. Jack Fernihough, a participant in the trial, attributed the telehealth technology to saving his life when it picked up the early signs his heart was under increased stress, which allowed him to receive lifesaving surgery. "In April this year I had a triple bypass and without the monitor we wouldn't have known that there was anything seriously wrong," Mr Fernihough said. "It found out things about my heart that I wouldn't have known about until it was too late and I'd probably be gone by now." 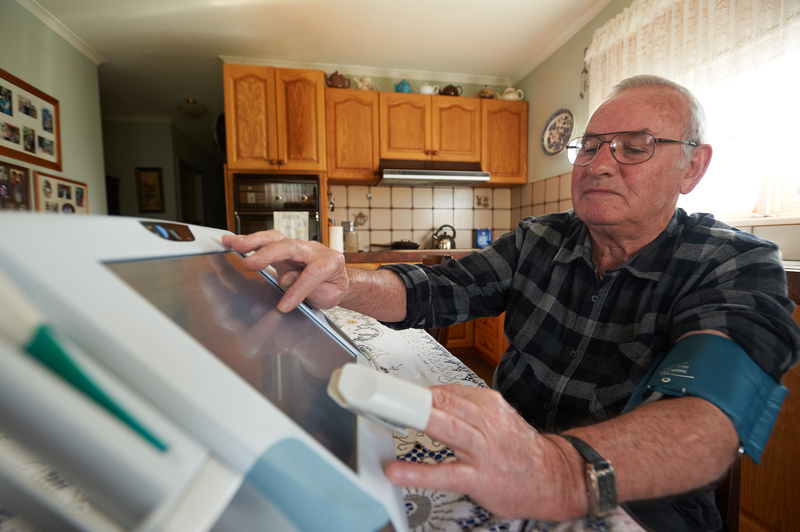 The 12 month trial, led by Project Director Prof Branko Celler enabled chronic disease patients to self-manage their conditions at home through the provision of telehealth services. 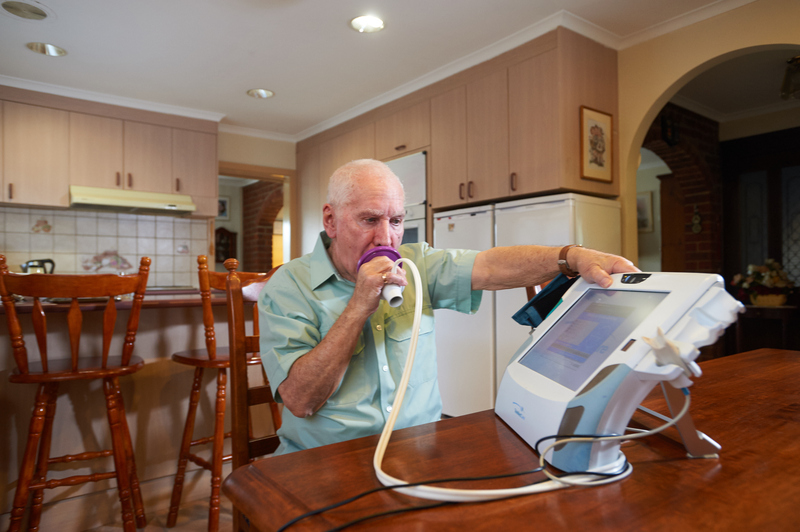 CSIRO lead researcher Dr Rajiv Jayasena said aged patients with multiple chronic diseases, such as cardiovascular disease, diabetes or chronic lung disease account for more than 70 per cent of our health system expenditure. "In addition to a 24 per cent savings of Medical Benefits Scheme expenditure over one year, the trial also showed a substantial 36 per cent decrease in hospital admission and most importantly a 42 per cent reduction in length of stay if admitted to hospital during the 12 month trial. "This is a huge saving when you consider the cost of a hospital bed per day is estimated to be about $2051 in Australia." Patients also had a reduced mortality rate of more than 40 per cent. Test patients were provided with a telehealth device that included participant/clinician video conferencing capabilities, messaging features and the delivery of clinical and study specific questionnaires, as well as vital signs devices to monitor their ECG, heart rate, spirometry, blood pressure, oxygen saturation, body weight and body temperature, with glucometry an optional add-on. Patients on the trial have reported improvements in anxiety, depression and quality of life, with many finding that home monitoring gave them a better understanding of their chronic conditions. Health workers can assess changes in their patient’s conditions remotely and provide appropriate care interventions earlier to help them stay out of hospital. Djerriwarrh Health Services' Telehealth nurse, Lay Yean Woo, said was a very easy process to monitor her patient's health results daily. "I can see the information in real-time, I can monitor them, following up with a phone call if there's any issues with their health," Ms Yean Woo said. "Also with the time that has been freed up for me I can look at more new clients being referred to me." 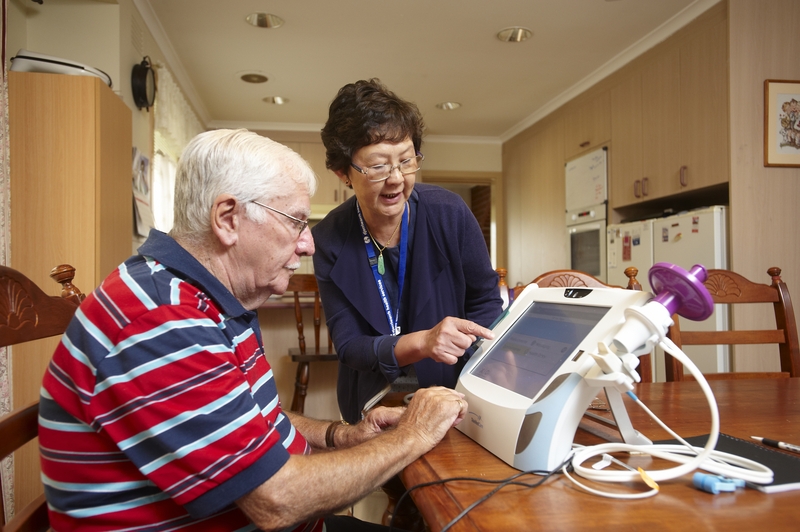 Over 500,000 Australians aged over 65 would be good candidates for at-home telemonitoring Dr Jayasena said. "Our research showed the return on investment of a telemonitoring initiative on a national scale would be in the order of five to one by reducing demand on hospital inpatient and outpatient services, reduced visits to GPs, reduced visits from community nurses and an overall reduced demand on increasingly scarce clinical resources," he said. Funded by the Australian Government Telehealth Pilots Program and CSIRO. Patients were provided with a telehealth device that included participant/clinician video conferencing capabilities, messaging features as well as vital signs devices to monitor their ECG, heart rate, spirometry, blood pressure, oxygen saturation, body weight and body temperature. The home monitoring telehealth device is easy to use and allows clinicians to assess changes in their patient’s conditions remotely and provide appropriate care interventions earlier to help them stay out of hospital. Telehealth nurse showing a patient how to use the home monitoring system.